This summer, Metrorail service will be closed at six stations for major renovations on the Blue and Yellow Lines in Virginia. Plan ahead and learn about other ways to commute to work while these stations are affected. 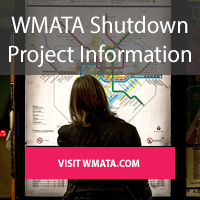 Share your project feedback via WMATA's Customer Survey. All Blue and Yellow Line stations south of Reagan National Airport will be closed. 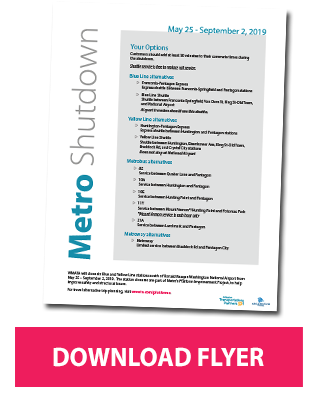 If your destination is on a Metro line beyond Pentagon, travel to Pentagon Metro Station using the options listed below or via a shuttle and then continue your trip. Shuttle service is free to replace rail service. 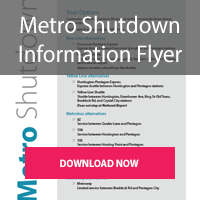 Express direct shuttles will be available to the Pentagon from Franconia-Springfield Metro Station and from Huntington Metro Station. Local shuttles will replace Metrorail in the affected area. Shuttle buses will run every five minutes during rush hours and every 10 minutes midday, except the Blue Line Shuttle, which will run every 10-12 minutes during midday. The Blue Line Shuttle will not stop at Braddock Road Metro. The Yellow Line Shuttle will not stop at Reagan National Airport. Join or form a vanpool and use your commuter benefits to offset the cost of parking and leasing a van, and avoid paying tolls. Slugging is the most affordable way to travel along I-95 and I-395 during rush hour and to take advantage of HOT- and HOV-lanes to access Crystal City, Pentagon City, and the Pentagon. Starting the week of May 20, the City of Alexandria will be increasing rush hour HOV requirements on Washington Street to HOV-3+. HOV hours will occur from 6:00—10:00 a.m. and from 3:00—7:00 p.m. The Mount Vernon Trail runs along the Potomac River to connect to Crystal City, Pentagon City, and the Pentagon, and can be accessed in Alexandria from the Eisenhower Avenue trail. 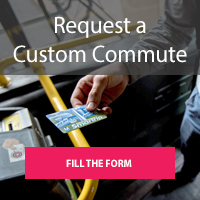 Click the destinations below to learn the best alternatives to commute to work. You can also plan your trip using WMATA’s Platform Project trip planning tool. Keep your business running smoothly during large-scale disruptions with customized services by Arlington Transportation Partners (ATP). Maintain business continuity with ATP’s complimentary assistance. Create and implement a telework plan for your company. We can also train your employees on how to maximize productivity outside of the office. Help your team move through traffic without the hassle, and take advantage of HOV increases in Alexandria. Employees can use their commuter benefits towards the cost of leasing, parking, and maintaining a van, while saving on tolls. ATP helps create vanpools and matches your employees to existing vans.